As visitors approach the main entrance of the Virginia Zoo they are greeted by a sculpture of a massive life-size African Elephant, its trunk inquisitively raised with a large golden butterfly perched on its end. Upon closer inspection the visitor discovers that the elephant is in fact composed entirely of thousands of butterflies of varying species, shapes and sizes. The visitor soon observes that the wings of the golden butterfly are in turn made of elephants. Complimentary to the educational and conservation initiatives of the Virginia Zoo, the artwork aims to illustrate in a playful fashion our interconnection with all that is. The Greek word for butterfly is Psyche and it is the same word for soul. This transformative symbol entwined with the elephant, a symbol of wisdom, evokes the link between knowledge, understanding and compassion as we strive to develop relationship in accord with the world in which we live. Highlighting our diversity as well as our commonalities, from the largest terrestrial animal to delicate wind bound insects, there is recognition that what we do to each other, our planet and its diverse ecology, we do to ourselves. 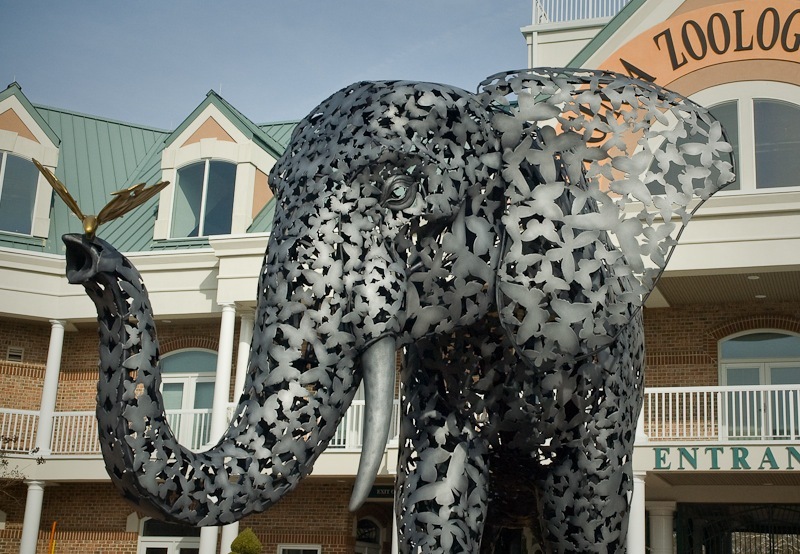 The artwork is iconic in stature with the placement in the main entry and speaks specifically to the wide range of experiences that visitors to the Virginia Zoo have, from exotic animal exhibits to the park setting and gardens. Accessible to all ages, the artwork is grand, dramatic, gentile and fun, and layered with possibilities for deeper understanding. The sculpture is fabricated in aluminum and measures approximately 16’ long, 7’ wide, with a 10’ shoulder height. An elegant linear armature that loosely follows the organic volume of the elephant has been welded and forged to provide structural stability. 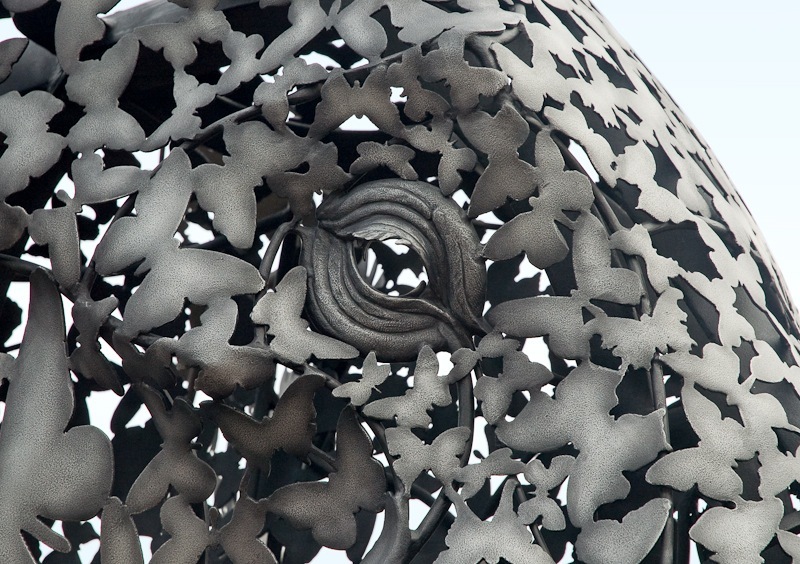 Spanning the spaces of the armature are over 6,000 butterfly silhouettes plasma-arc cut from sheets in thicknesses ranging from 1/8”–3/16”, hand forged and shaped to complete the surface of the elephant. The large (18” wing span) golden butterfly with the elephant wings is cast in aluminum and gilded with 24k gold.